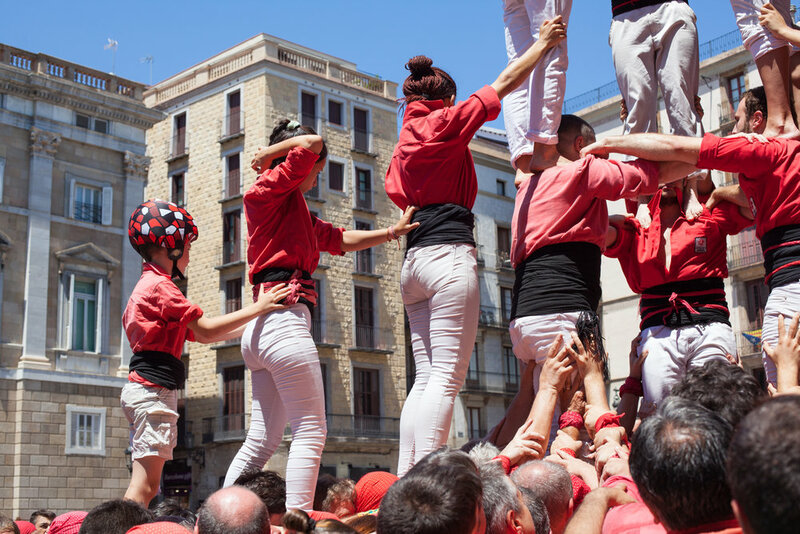 A castell (Catalan pronunciation: [kəsˈteʎ]) is a human tower built traditionally in festivals at many locations within Catalonia. At these festivals, several colles castelleres (groups who construct towers) often succeed in building and dismantling a tower's structure. This particular castell festival took place in the centre of Barcelona on the 18th June 2017 in Placa Sant Jaume. It is a an amazing spectacle to watch, the strength and agility of those involved is impressive. The atmosphere is very friendly and the emotions of those involved upon completion of a castell are highly visible. Click through the images below of this Catalan tradition and the people involved. A Castell in Placa Sant Jaume, Barcelona. Photography Tours in Barcelona by Geraint Rowland. A human castle in Barcelona, a Catalan tradition. Street Photography in Barcelona by Geraint Rowland Photography. More of my travel photography from Spain can be found on my website, my Instagram, and my Flickr account. If you are interested in purchasing any prints, using an image online or would like further information please send me an email at: geraintrowlandphotography@gmail.com.